As such TAG on Wednesday, November 28, 2018, presented a cheque for $3,000 to the Cancer Society which represents a combination of part proceeds from vehicle sales in October and donations from customers who purchased vehicles during the promotion period. TAG’s Managing Director, Patricia M. Romney, in a subsequent statement today, November 30, 2018, explained that the personal aspect of TAG’s affiliation with the Cancer Society is sadly related to the number of persons within her family that have been directly affected. “Being so close and seeing the hurt to the actual individuals who suffered through such harrowing fights, motivated me to be part of an effort that fights to combat the disease and offer nurturing support to the caregivers and loved ones who lose close persons to the fight,” Ms Romney stated. While TAG’s partnership with the BVI Cancer Society will directly support their programs, including improved access to mammography screenings and cancer care support, Romney said families affected also need support. 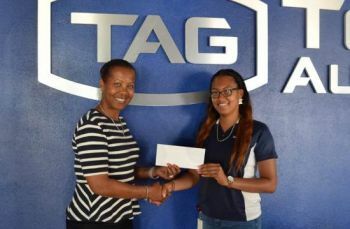 She is hopeful that TAG’s donation along with those from customers who generously participated goes specifically to help the caregivers fulfill their roles that often drain personal resources. “I also am hopeful that educating our people on proper dietary practices does help to prevent cancer. These are measures we need to spend time and efforts on equally,” Ms Romney shared. 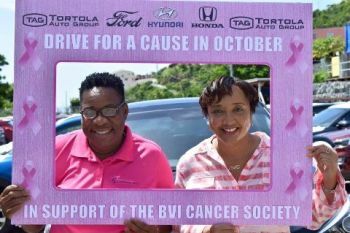 Through the partnership program, ‘Drive for a Cause’, a portion of the proceeds from the sale of select Hyundai, Ford and Honda models were set aside for the BVI Cancer Society.